Find My Workspace lists over 95% of the serviced offices market in Bukit Merah. Simply click Request Quote to check pricing for one office, or Add to Basket for multiple offices. Beyond its prime business address, this prestigious tower offers a unique experience far above that of the conventional business district. Full-height glass windows offer unobstructed views of the sea, the marina, Mount Faber and water-front residences. The location allows you to commute island-wide with ease. Live and work connected to a plethora of urban delights, with Harbour Front MRT Station, VivoCity (Singapore’s largest lifestyle mall) and Sentosa in the vicinity. This business centre is the home of a well established event and talent management company, who are looking for suitable people working in the creative field to share their work space. Clients can pick from a choice of having a hot-desk for working on a flexible basis or a fixed desk to call home. There are plenty of facilities available in this space, including and not limited to high-speed WiFi and pantry space. Flexible access is available for all tenants, and the terms of stay in this office space are also as flexible as you need them to be. Get in touch for more information regarding this office space. 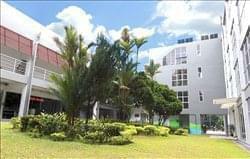 Each office comes well-equipped with top-quality fittings, state-of-the-art Cisco IP phone system, High-speed and secure fibre optic internet, 24 hours individually controlled Air-conditioning, accessible 7 days a week, 24/7. From the welcoming personal business executive to the fully equipped conference room, pantry and stationary area, our facilities provide a one-stop solution for your business needs. The Centre features a spacious lounge providing clients and their guests a place to relax and unwind over a cup of coffee or glass of wine. Virtual Office Packages start from $22/month. Work stations start from $300/ month. Private and shared rooms available for 1 to 8 people. Flexible terms and daily rates available. Located at the HarbourFront Precinct, this is an 18-storey office building which features many blue-chip multinational corporations. It is an established locale and bustling hub for work and play located along Singapore’s southern waterfront. 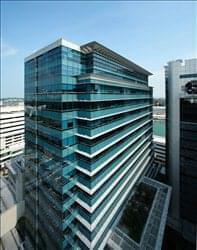 In order to cater to the growing demand of businesses locating on the CBD fringe, the towers have been developed into a premium office development located in close proximity to Singapore’s largest retail mall, cruise facilities and are easily accessible by public transport. This great location offers top quality office spaces with many supporting amenities all seamlessly linked, creating a thriving business and lifestyle locality at the fringe of Singapore’s CBD. With new developments and building enhancements, this is an ideal location for businesses looking for a well-equipped and highly convenient world-class waterfront destination. This workspace provides shared facilities catering to commercial clients allowing them to operate their businesses on a 24×7 basis at a significantly lower cost compared to operating their own workspace. 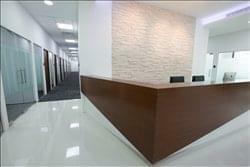 This is a fully equipped and fully furnished facility that offers flexible contract duration and feature options. This facility provides a variety of office suites and spaces in addition to a wide range of business services such as virtual office, cloud, networking and high speed internet access, telephony services, conference/meeting room facilities among others. To obtain information for your selected Bukit Merah Serviced Offices, please tick the "Add to basket" box for each office you prefer and complete the form below. We will then send a detailed report via email.